The Director of Technology at the Kinkaid School (TX) explains how schools have become platforms and utilities as we use more and more electronic resources in education. How does this change our purpose and practice as we look at policies in our communities? Many thanks to Sarah Ulansey-Tkach (@heysarahtk) of Castilleja School (CA) for providing thoughtful Twitter commentary on the webinar-in-progress. For our September Leadership Webinar, we interviewed Susan Bearden, who recently served as project lead on the 2017 update of Building Technology Infrastructure for Learning produced by Office of Educational Technology, U.S. Department of Education. Susan is now a consultant on technology and learning in school. A frequent guest host for our monthly G Suite User Group, William Stites, Montclair Kimberley Academy, discusses the decisions and issues that arise when off-boarding students and faculty from a school's database. Leadership Webinar: "Introduction to ECATD"
An information session on the Early Career and Aspiring Technology Directors (ECATD) institute, featuring Connie White, Woodward Academy (GA), Curt Lieneck, retired, formerly of the University of Chicago Laboratory Schools (IL), Daisy Steele of Catlin Gabel School (OR), and Ashley Cross, Manager of Membership for ATLIS. Hosted by Susan Davis, Dir. of Professional Development, ATLIS, and Sarah Hanawald, Executive Director of ATLIS. Barry Kallmeyer of Hathaway Brown School (OH) and Amanda Cadran from Lea(R)n help us unpack ways to leverage the collective buying power of ATLIS schools to encourage vendors to complete registration with pricing guaranteed for one year to ATLIS members. Sarah Hanawald, Executive Director of ATLIS, and Susan Davis, Professional Development for ATLIS, talk about what they've learned about best practices from the Technology Impact and Efficacy surveys. For our How To series, we invited Amy Grunat of the Drew School (CA), Tye Campbell of Gilman School (MD), and Larry Kahn of Trinity Valley School (TX) to discuss the accreditation process. We introduced the ATLIS Accreditation Guide to Self-Study and discussed how it can be used whenever a school needs to conduct a review of its programs, whether for an accreditation self-study, for orienting new members to a school community (admin, faculty, or staff), or for future planning. Members can access the complete Guide to Self-Study in our Document Library. Amanda highlights some of the advances to our Lea(r)n member benefit. ATLIS members are able to access data collection tools and dashboards for analyzing software utilization to provide rich insights about leveraging technology effectively. Nate Green of Flint Hill School (VA) and Ashley Cross of St. Stephen's Episcopal Day School (FL) wrestle with the place of academic technology in today's independent schools. Tim Fish, Chief Innovation Officer at NAIS, shares his thinking on how to unlock learning innovation in schools. What is technology's role and how can tech leaders create opportunities for the kind of structured student agency that is at the heart of innovation? You can access Tim's slide deck here. The CETL-Why Independent School Leaders Should Take A Look. Join ATLIS members Tim Maki of Tilton School (NH) and Alex Podchaski of Oak Knoll School of the Holy Child (NJ) along with Morgean Hirt from CoSN for a discussion of their experience with CoSN's Certified Education Technology Leader course and exam. Our August 2018 Leadership webinar focused on "Onboarding Best Practices" and featured Jim Bologna, Windward School (CA); Ally Wenzel, Stevenson School (CA), and Jamie Britto, Collegiate School (VA). Tricia Edwards, Associate Director for Smithsonian Affiliations and formerly Head of Education for the Smithsonian’s Lemelson Center for the Study of Invention and Innovation at the National Museum of American History joined us to preview her Luncheon Keynote at ATLIS AC 2018 on invention education, inquiry-based learning, and evaluation. In a post-Thanksgiving webinar, as part of our "How To" series, Sarah Hanawald interviewed Beth Holland on the topic of evaluating research. Beth is a doctoral candidate at the Johns Hopkins School of Education and a well-known member of the independent school technology community, During the interview, Sarah and Beth discussed the critical role that educators play in actively reading, interpreting, and analyzing research. They covered a host of disparate ideas, from determining the credibility of the source to questioning whether the results of a study can be generalized to other contexts and settings. On her "EdTech Researcher" blog at Education Week, Beth has written several posts about reading and interpreting research that may be helpful. Links to these posts are shared below the video. Read the blog post on this webinar here. Research Says..... from Sarah Hanawald on Vimeo. Anne Sena of St. David's School (NC) led this detailed discussion about managing data processes. Whether a school is in a sustaining position with an existing SIS, evaluating the potential to consolidate, upgrade, and migrate to a new SIS, or actively involved in SIS implementation, having an in-depth understanding of each aspect of the school's processes (including data flows (in and out), upstream and downstream systems, data creators, data consumers, data stewardship) is a key factor to fully leverage the SIS your school uses and to streamline or enhance the various processes affect how your school functions. Join us as we share experiences with process assessments, discuss how to initiate an effective process assessment, and detail the spectrum of process assessment efforts. Jeannie Crowley of the Ethical Culture Fieldston School shared how she structured the process at her school for evaluating SIS options. Those viewing may also be interested in the ATLIS decision-making whitepaper available in our document library. In addition, Jeannie has kindly shared her slides for the webinar with the ATLIS community. SIS Online Usergroup: SIS Evaluation from Sarah Hanawald on Vimeo. Hosts Jason Ramsden (Ravenscroft, NC) and Hiram Cuevas (St. Christopher's, VA) interview Richard Anderson (Washington InternationalSchool, DC) and Barry Kallmeyer (Hathaway Brown School, OH) about how to leverage the tools and apps already available to many schools within G-Suite to engage faculty in curriculum mapping and review. Interested in adapting these tools to your own school environment? Richard will lead a hands-on Bootcamp on "Curriculum Mapping and Extending G Suite with Apps Script" at our Annual Conference in Washington, DC, on April 15-18. Learn more about the conference here. G-Suite User Group Webinar: Using G-Suite for Curriculum Mapping from Sarah Hanawald on Vimeo. Ethan Delavan and Kelly Vikstrom-Hoyt (The Bush School, WA) and Audrey Imhoff (Kent Denver School, CO) join us to continue the discussion on libraries as innovation centers which began at April's Annual Conference. John Yen of Polytechnic School (CA), Dana Smith of Greensboro Day School (NC), and Paul Tidmore (joined by Jenn Makins) of Parish Episcopal School (TX) share their experiences with imagining, designing, and growing makerspaces at their schools. Dana's focus has been to find out more about how making is already embedded in her school community and in the curriculum, with an eye toward designing a space to support what is already happening in her school. Paul's approach has been to learn from his school's large space which grew out of an after-school robotics program into a "subway map" of a curriculum. With new space availability at hand, he wants to consider what is missing, give greater attention to aesthetics, and monitor the process for construction. John provided an overview of of how his school jumped into revamping a computer lab into a makerspace and now is considering the bigger picture of making as learning as a school initiative. 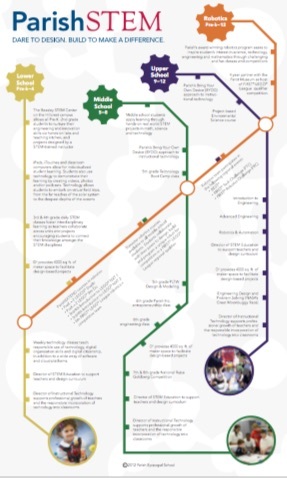 See also the "subway map" of Parish Epsicopal's STEM/making curriculum, shared by Paul and Jenn (above). ATLIS Makerspace User Group: Focus on Community Engagement from Sarah Hanawald on Vimeo. Justin Curtis and Mary DoBroth discuss from different perspectives how they approached developing a maker curriculum. We would love to hear your stories about how you have encouraged curricula development for making in your school. ATLIS September 2017 Makerspace User Group Meeting from Sarah Hanawald on Vimeo. Our August "How To" webinar featured tips and suggestions from ATLIS staff member Susan Davis on writing proposals for our 2018 Annual Conference. Here's the video! ATLIS Conference Proposal Submission Tips from Sarah Hanawald on Vimeo. Join us for an exploration of free tools for educators that are browser-based and encourage students to analyze data by developing sophisticated maps? Geospatial mapping tools used to be difficult to use, but that is no longer the case. Join Gayle Wilson from Albuquerque Academy and Joseph Kerski from ESRI to learn how schools can use this free resource across the curriculum and in multiple grade levels. Below the video is a list of websites shared during the webinar. GIS from Sarah Hanawald on Vimeo. Veracross's Aaron Vogelzang joined us for a discussion about technology leadership in the area of data management. What does it mean when we say "integrated data" and what benefits and challenges come with truly integrated data. How can technology leaders help their schools manage data effectively? Jon Moser, CEO and Founder of Finalsite, shared tactics and strategies on how you can analyze your school’s Strengths, Weaknesses, Opportunities and Threats with data-driven information that will help you to make better decisions for success. Case studies from independent school highlighted what you need to be thinking about now. We took a look at new search trends and tech tools to inspire us to shake up the traditional ways you recruit and retain students. Sarah Hanawald, ATLIS Executive Director, and Marc Chervitz, Director of Client Services for ERate Program, LLC discuss the details of the ERate program and how independent schools can save significant money by taking advantage of this program. Alex Inman from Educational Collaborators joined us for this year's first online user group meeting to discuss all things GAFE (now G- Suite!). Alex shared updates about the Google Educator Certification programs. Other topics under discussion were: The new name (G Suite), dealing with corrupt profiles, how to get support and digital privacy. For upcoming events, check our calendar. The ISED-L conversation opened with: "Has anyone made the move from Education Edge to onRecord/onBoard or the NXT products since the Blackbaud/Whipple Hill merger that would be willing to share their experience?" Several listserv participants volunteered to share their experience with transitions with colleagues. For upcoming events check our calendar. The conversation covered a wide variety of topics, including Vault, document retention, suspending vs. removing accounts, Active Directory issues, synchronization errors and more. Just below the embedded video are some links shared during the conversation. GAM, a command line tool for managing many aspects of GAFE. Jason Snook, a systems engineer with Quorum, joined us to discuss the principles of DRaaS or Disaster Recovery as a Service. Jason shared communications techniques school technology leaders can utilize to better educate other school leaders about the importance of having a plan for recovering when a data catastrophe strikes. Attendees learned how to assess their internal readiness, including suggestions for setting up realistic scenarios for testing recovering capacity. Jason's line: "if it takes more than a few minutes, you're doing it wrong" resonated with those attending the webinar. Did you miss the Leading IT All session at ATLIS 2016? Were you intrigued by the tweets or the follow-up discussion on ISED-L? Catch Jamie Britto (Collegiate School, VA), Barry Kallmeyer (Hathaway Brown School, OH), Cathy Kyle (Presbyterian Day School, TN), Howard Levin (Convent & Stuart Hall, CA) and Jason Ramdsen (Ravenscroft, NC) as they re-create their standing-room-only session. They were joined by Jack Hardcastle in the role of chief questioner. Jack returned to school following ATLIS 2016 to learn that he was about to assume the title of CIO! His request (plea?) for materials from the session on ISED-L led to a lively exchange and this offering.